The main goal of music is to make us feel. Whether it’s angry, sad, or happy, the best music hits us at our core. All the great artists are able to reach these emotions and bring them to the forefront of the listener’s mind. So it’s fitting that Justin Timberlake, one of the best artists of the past decade, and his newest song, “Can’t Stop The Feeling”, are easily able to make any listener get up and dance with joy. Unsurprisingly, the music video that accompanies the song capitalizes on these emotions and highlights them to perfection. 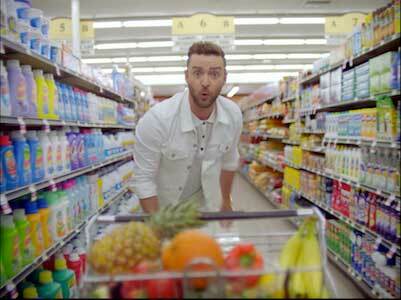 Justin Timberlake feeling something in the grocery store! The song is off of the soundtrack to Timberlake’s new animated Dreamworks film, Trolls. The song’s lyrics describe an infectious & effervescent feeling that just won’t go away. It’s a feeling that would make even the most sour of people get up and dance. This song is very akin to Pharrell’s smash hit from a few years ago, “Happy”. The music video conveys this message by having everyday people dance like nobody's watching, whether they are at work, home, or even in the street. The video cuts back and forth between these average joes and Justin Timberlake, who is dancing only like he can. Everybody is having fun and acting like a fool, and that makes the watcher/listener want to groove along. Galen can’t stop the feeling in his pair of white chucks! Chucks are featured by a few of the everyday people in this video. Galen, an employee from the world-famous Randy’s Donuts in Los Angeles, is wearing a pair of worn in all-white, high-top chucks. 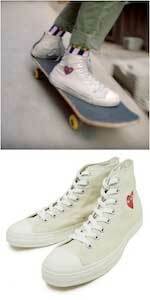 Meanwhile, Maceo, a skateboarder, is rocking a pair of beige, high-top Comme des Garcons chucks. This song is as infectious as it is playful, and will be making people move for years to come, hopefully in a pair of Chuck Taylors! Maceo rocking a unique pair of Comme des Garcons chucks. Get yourself a pair of dancing chucks by clicking on the links below.